Patagonia’s national parks are immense spread over 800,000 square miles and two countries. Chile’s world famous Torres Del Paine National Park is the bucket list destination, but Argentina’s Glaciares National Park may be as scenic and as trek worthy as its better known sister. You just have to work harder to experience it. Unlike Torres Del Paine where the minute you drive into the park there is a drop dead glorious panorama of mountain spires and lakes, Glaciares is more subtle. It requires pounding the trail on arduous day hikes to reap visual payoffs that are completely worth the sweat and boot leather. The views of Mount Fitz Roy and Cerro Torre with their attendant lakes, glaciers and rivers are as good as it gets in Patagonia and perhaps anywhere on the planet. 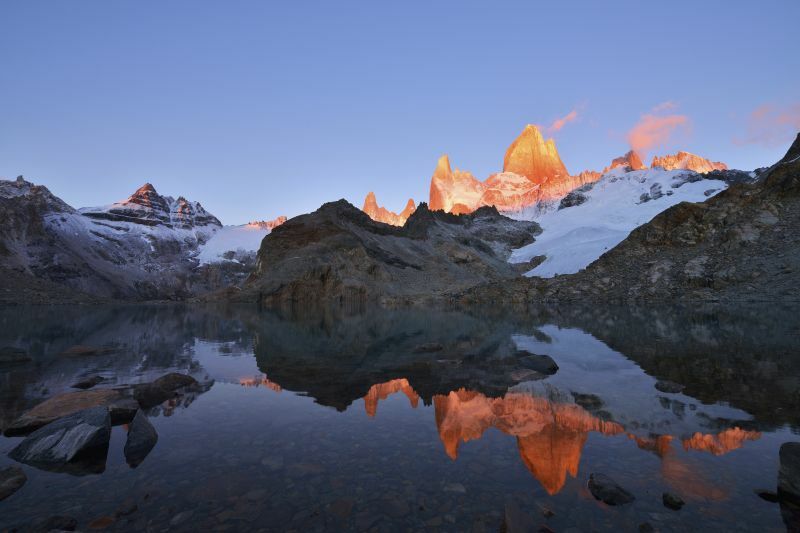 Tusker offers a five day optional trek to Glaciares that is tacked onto our nine-day Torres Del Paine backcountry trek. This is a trip that can stand on its own, and many serious hikers who venture to southern Patagonia opt for Argentina over Chile because its trails are far less congested. We’re not suggesting you pick one or the other. If you have the time and money it’s a no brainer— you’ve journeyed this far south. You should do both. It’s a five to six hour drive from Chile’s Puerto Natales to El Chalten Argentina where Tusker’s Torres Del Paine leg ends and its Argentina adventure begins. El Chalten was founded in 1985 but has a frontier feel that retains its hippie values. Its main street was only recently paved and excellent mountain trails begin in town. There is no light pollution in these parts and the 2010 solar eclipse was best viewed from here. The Tusker vehicle goes through town and heads up the Rio de las Vueltas Valley. This is where Hosteria El Pilar sits in splendid isolation with views of Fitz Roy and the lower river valley below it. Hosteria El Pilar is surrounded by mountains and is a few steps from the trails that will unravel their majesty. For Patagonia this a luxurious place considering its backcountry setting where you see no other buildings, just trees, boulders in the rivers and of course the towering pinnacles that rise above the valley. You will spend two nights here and will probably wish you could stay longer. The rooms are large, the food hearty and the enthusiastic outdoorsy staff eager to spend time with you to share their knowledge of the backcountry that looms ahead. The library is well stocked and you will feel like you could spend some serious time here kicking back, soaking up some Patagonia sun and wind or starting that novel that has kept you awake for decades. But you didn’t come here to loaf, the Fitz Roy massif waits. As Eva Peron, Madonna sang, ‘Don’t cry for me Argentina,’ but there is nothing to cry about here unless you’re shedding tears of joy. Get a good night’s sleep and have a solid breakfast because the trek to Laguna de las Tres is a 14-mile roundtrip well worth the ten hour investment. Laguna de las Tres is so named because rising above it are arguably three of the most spectacular peaks rising out of the Southern Patagonia Ice Field. Mt. Fitz Roy at 11,171 feet is the highest and most technically challenging and was first climbed by French alpinists in 1952. Yvon Chouinard bagged it 1968 and it became the symbol for his Patagonia outdoor company. The peak was named for British marine captain Robert Fitzroy who skippered HMS Beagle on the South American scientific expedition that put Charles Darwin on the map in the 19thcentury. The other peaks above the lake are Cerro Torre, 10,262 feet and Cerro Poincenot, 9,849 feet. The hike follows the river for two hours then flattens in an upper valley before the final 1,500 foot ascent to the lake basin. The trail is well architected with switchbacks easing the pain to the lake basin and its cobalt blue tranquility. A side trail around the lake leads to an overlook of the smaller Lake Sucia. The cliff sides here are sheer and views of the larger peaks off in the near distance are angled making for dramatic photos if you can capture them. The following day’s hike is not as long, but some consider it the best hike in Glaciares for its biodiversity and rewarding views. The trek up to Loma Del Pliege Tumbado surprisingly has the fewest people on it and gradually ascends on a nicely switch backed 1,500 foot escalator to a plateau and then a step ascent to one of three rounded summits. The far right summit offers amazing 360 degree views of Fitz Roy and Cerro Torre that sits behind it in Torres Del Paine national park. The peaks alone would be worth the 11 mile, eight hour jaunt, but you will see glaciers, lakes and rivers as well. This trail gets you closest to Fitz Roy’s granite walls and peripheral needles that make good photo ops with good angles and changing light. It’s also the best hike to get up close and personal with the Andean condor. Hikers have gotten within five feet of these majestic mountaintop gatekeepers. Glaciares National Park is best known for its glaciers and on Day 4 you will understand why. After a late afternoon drive we arrive in El Calafate, another pioneer town, but older established in 1927 by wood traders that has mushroomed to 20,000 thanks to tourism. The town’s main attraction is the Glaciarium, perhaps the world’s only museum solely devoted to glaciers. It’s modern and high tech and its uniqueness includes an ice bar constructed of glacier ice. Wear your sweater because the drinks are not the only thing cool in this bar. It’s so cold you’re limited to a half hour visit. We stay in another icy themed edifice the smart Hosteria Los Hielos that offers great views of Lake Argentino where we will spend two nights. The final day is probably the one you will remember for the rest of your life. 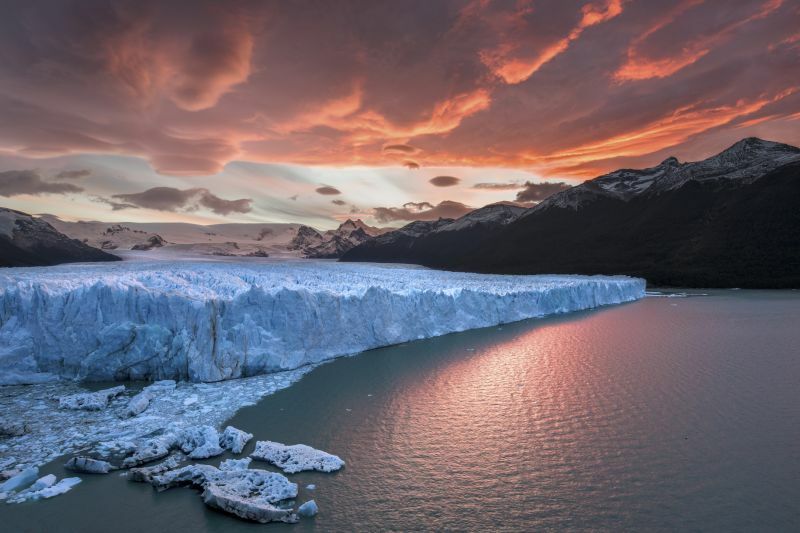 The Perito Moreno Glacier is massive at 19 miles long and nearly 600 feet thick along with its 200 foot high Adriana face. It’s rare to get this close to such an immense dangerously alive block of ice. From the elaborate wooden walkways that meander along the shore at different heights you get extraordinary views of the glacier. When it calves the falling ice crashes into the milky grey water making one of nature’s most natural yet powerful sounds. It’s a spectacle, worth the cold boat ride up the Rio Brazos to get to this spot. You will ponder the effects of global warming and also revel in your chance to seeing one of the world’s great glaciers still largely intact. The Argentina option is a non-stop outdoor adventurist’s thrill ride. The hikes and glacier gawking on top of the nine-day Chile itinerary are designed to give you a sense of Patagonia’s immense diversity and spectacular scenery. It’s the kind of trip that questions your ability to have the mental and physical ability to absorb it all yet remain open for more. With its end of the world setting, it’s likely this will be your only shot at getting here. Do yourself a favor, maximize each day both in Chile and Argentina.